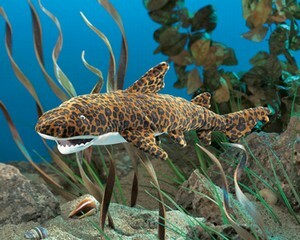 this shark puppet is sporting a rich fantasy leopard jacquard. His teeth are soft vinyl, so even if he catches you, you'll feel no pain from this sleek but chic LEOPARD SHARK puppet. Measures 22” long, 10” wide, 6” tall. Movable mouth.